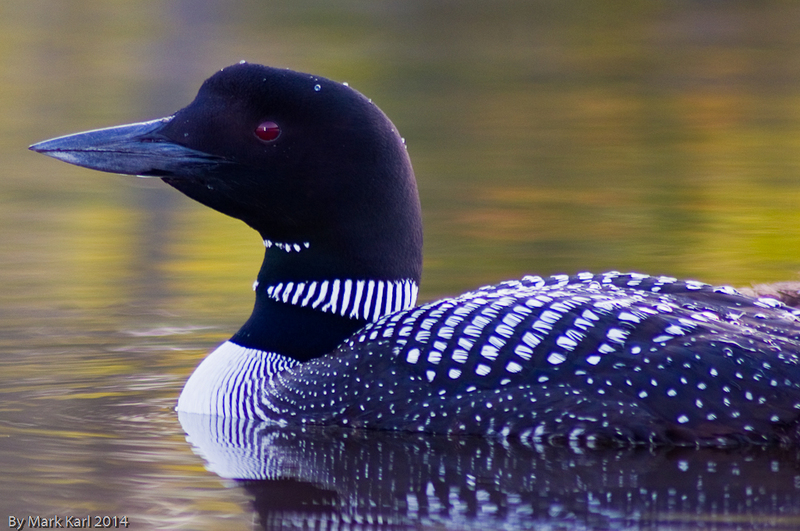 I recently went for an early morning kayak trip on Grafton Pond in Grafton, NH. I was at the pond about 6:30 a.m. to catch the morning mist on the water and early wildlife sightings. 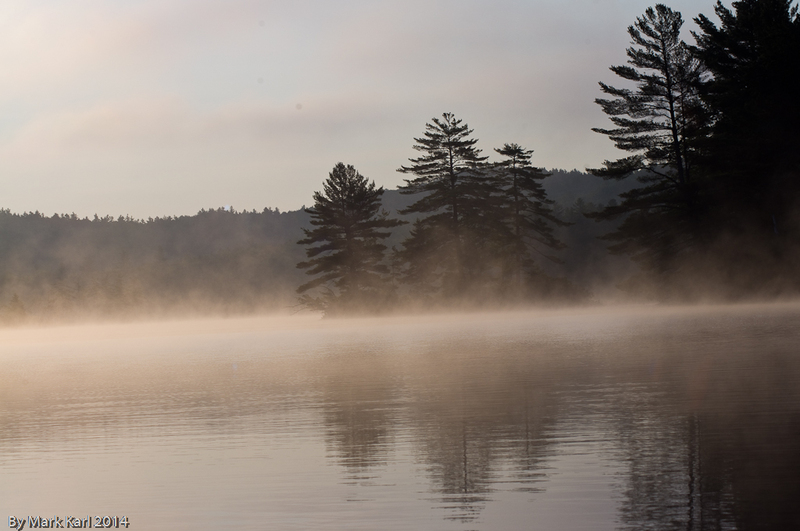 Morning mist on Grafton Pond. 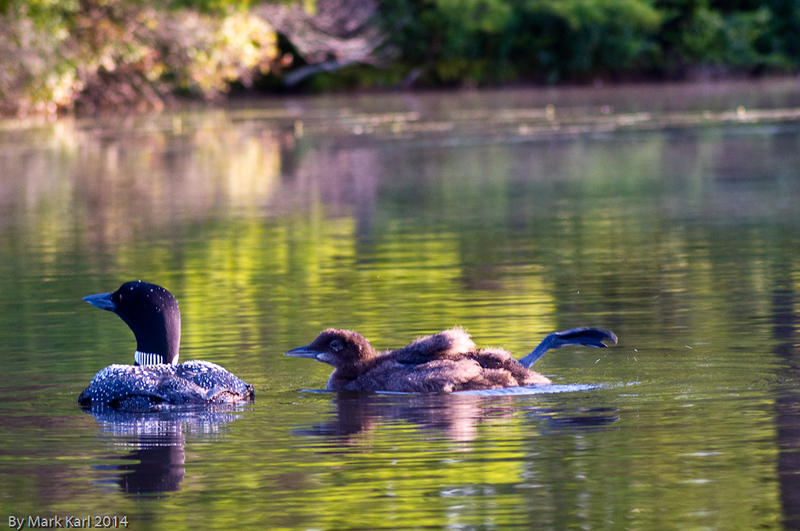 Shortly after leaving the boat landing I spotted a family of Canada Geese. As they went around one side of an island I want around the other. I was hoping to get in position with the morning sun to my back and shining on the geese. 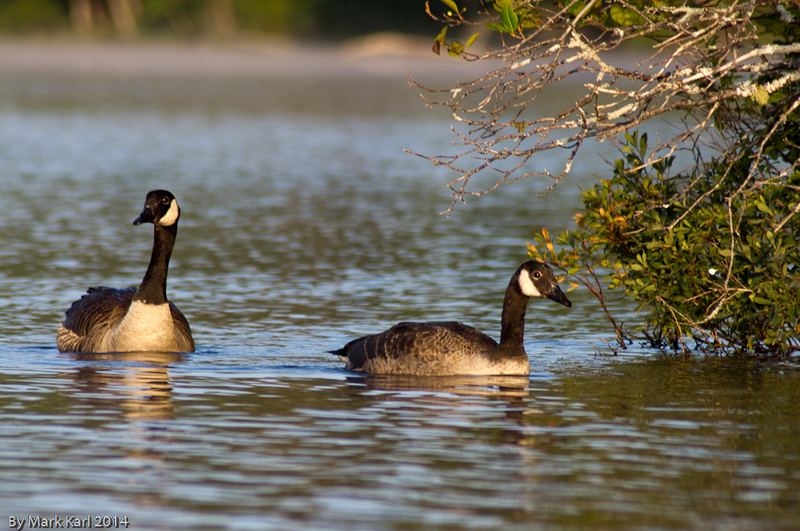 Canada Geese at Grafton Pond. 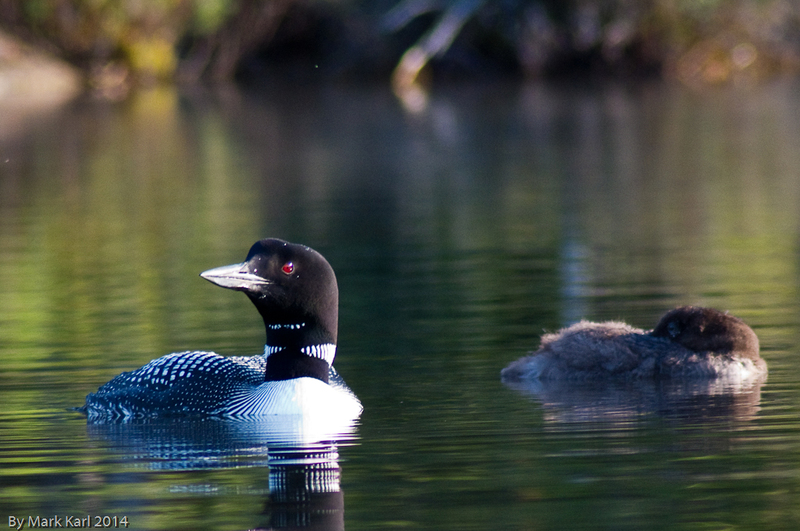 They did not seem bothered by the fact that I was quietly floating around in my kayak nearby. 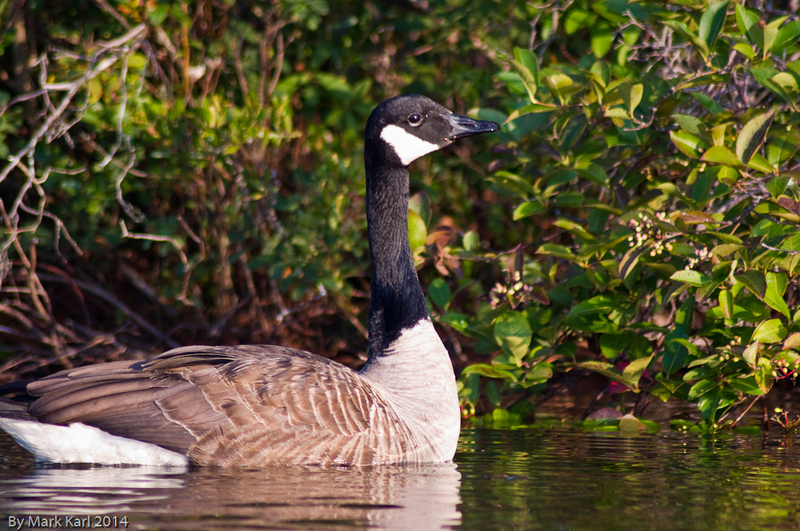 Canada Goose on Grafton Pond. Showing no fear, one of them swam right over to me to check me out. 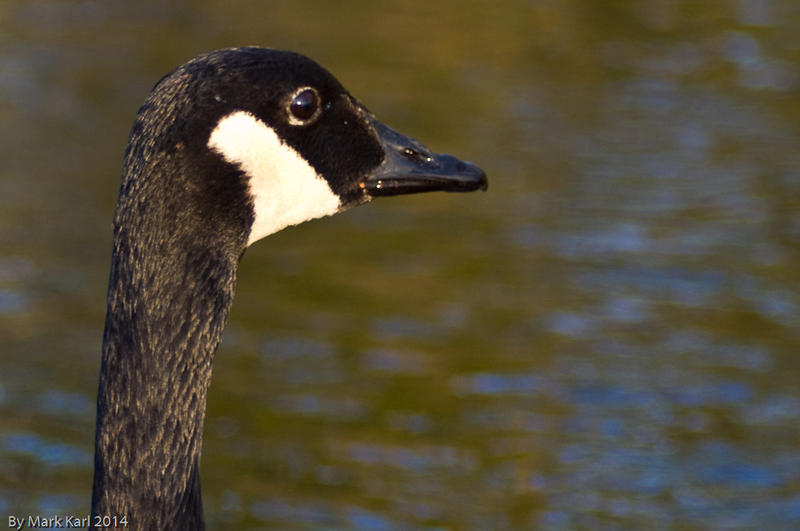 Close up of a Canada Goose on Grafton Pond. I paddled around while exploring some of the hidden coves in the pond before coming back to a group of small islands. 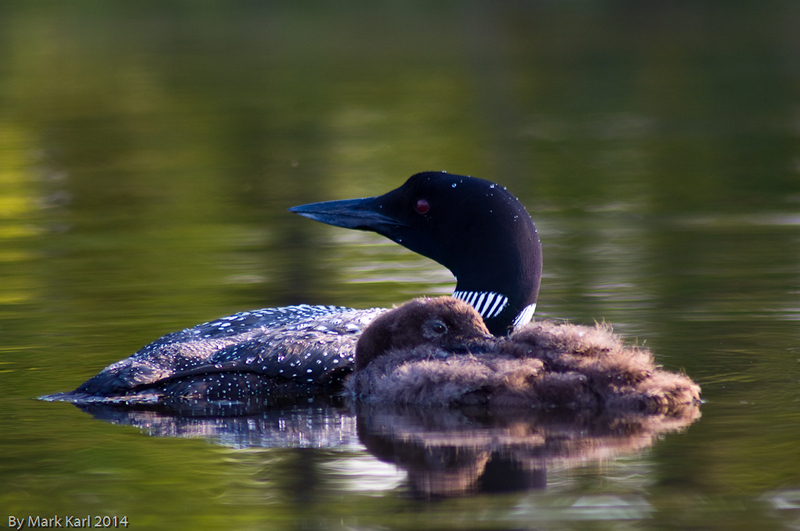 I was drifting near one of the islands when I noticed a loon with a sleeping chick. The chick woke up for a minute for a stretch. The chick wakes up for a stretch. 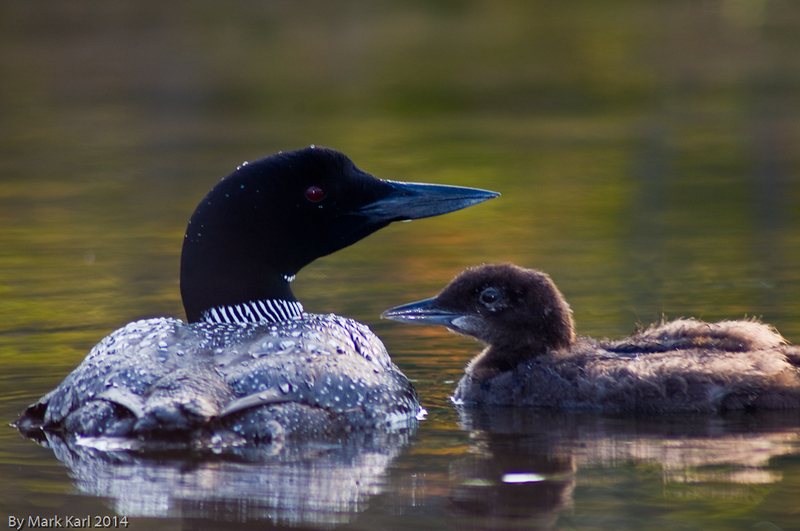 Loon on and chick on Grafton Pond. Much to my surprise I spotted a seagull on the way back the boat landing. This is unusual because the pond is at lease a couple hundred miles from the ocean. 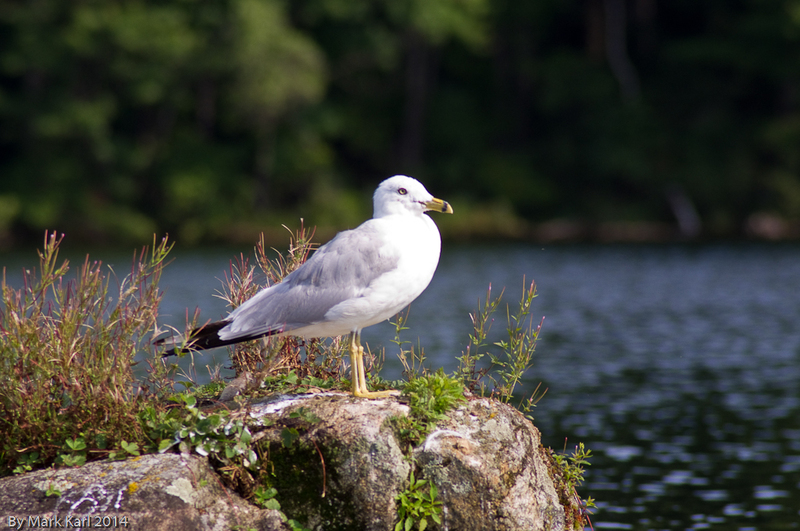 A Seagull on Grafton Pond. Since it was Saturday I was able to finish off the trip with one more night dive. Of course Oscar the Goliath Grouper met us under that boat. Our group took off in another direction from Oscar to see some different marine life and give the other groups some space. We encountered many turtles during the dive including this one. While on the dive boat on the way to the dive site I jokingly said, “Now that I have seen an octopus I would like to see a squid tonight.” Much to my amazement we actually did see a squid. Not only that, I was able to get very close for some video footage. I was sad that it had to end. I also feel lucky that I had so many fantastic marine life sightings and get some of them on video. I also achieved my goals for the trip to do more night dives and get my Nitrox certification. Thursday, July 10th turned out to be an eventful day. Once again we started the day at Molasses Reef. We were lucky enough to discover a Hawksbill Turtle right below that boat when we arrived. I was able to get some great footage of it eating. Later on I was trying to get some video footage of some staghorn coral covered in algae. A Three Spot Damselfish “attacked” my camera and stole the show. Since it was Thursday I could go on another night dive. I was looking forward to going back to Molasses Reef and swimming with Oscar the Goliath Grouper. It was really cool to watch the sunset from the dive boat. Sure enough Oscar was waiting for us below the boat once we got in the water. I was amazed that Oscar was so friendly. He swam between my legs twice. It reminded me of something a pet dog might do. After Oscar greeted everyone he started to look for fish to eat that were illuminated by our dive lights. Sure enough, he eventually found a young Parrotfish to eat. When he “inhaled” the fish and closed his mouth we could see and feel the shock wave in the water. The dive got even better since we encountered several sea turtles. Just when I thought it could not get any better we spotted a small octopus on our way back to the boat. Wednesday, July 9th was a great day full of fantastic sea life sightings. We started the day on Molasses Reef. Once we arrived at the site I was thrilled to discover the visibility was excellent and the current moderate. It great conditions for shooting video. We started the day with several Spotted Eagle Ray sightings. I had been waiting for Eagle Ray sightings like these since I purchased my GoPro last year. Although I had several Spotted Eagle Ray encounters during the trip this was the best. My luck continued as I spotted a beautiful Nassau Grouper. The boat took us north towards an area known as the Elbow for the afternoon dive. Due to the proximity to the Gulf Steam Current the Elbow is known for good visibility. 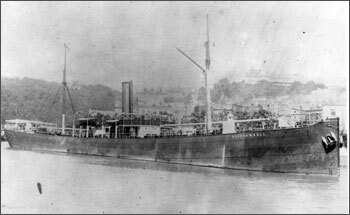 We were going to two shallow wrecks named Mikes Wreck and the City of Washington. Part of the fun of diving is fish identification. After you have been at it a while it’s exciting to find an uncommon or rare fish to identify. These Glasseye Snappers are an example. They caught my attention because I liked their silver and red body pattern, but I hadn’t them before. I shot some video to help me research and identify the fish. The Queen Anglefish is one of my favorite species. They can be challenging to photograph and even video sometimes since they are always moving and can be skittish around divers. At the City of Washington wreck I spotted a lobster right out the open, which is rare. I was able to get some good close-up video of it. I was thrilled to get some footage of this Hogfish. The Hogfish has this wonderful ability to change color to match its surroundings. I have seen them change from a light color to match the sand to brown and white stripes that blends with the turtle grass it was feeding in. This one goes from brown to “sand color” as it moved off of the wreck. On Monday, July 7th we headed out to Molasses Reef for the morning dive. We discovered the current was pretty strong. This makes the dive a bit more challenging but usually improves visibility. My luck was still good and I was the only one in the group to see (and get video) this Spotted Eagle Ray to swim by. This was my first Eagle Ray sighting of the trip. This video gives you a good idea how string the current was. It sure makes it harder to keep the camera (and yourself) steady. Later in the dive the whole group had a close encounter with a curious small Green Sea Turtle. We initially spotted it on the surface getting some air, which is a good place to look for turtles. I got a visual treat when a school of Blue Tang swam on by. With hope of finding a site with less current we headed to French Reef for the afternoon dive. Although the current was far less, the visibility was terrible. We could not see much and video conditions were poor for most sightings. We were lucky enough to see two Goliath Groupers. I was able to get some video footage of one of them as it swam by. The Grouper could have been our friend Oscar from the night dives. French Reef is not that far from Molasses Reef for a Grouper. 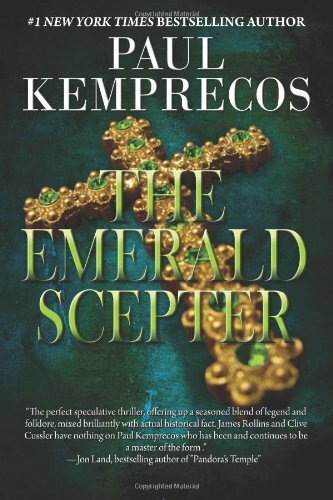 The Emerald Scepter was one of several books I enjoyed while on vacation in Key Largo. I had read many of the “Soc” series books by Paul Kemprecos and really enjoyed them. I had thought this was another Aristotle “Soc” Socarides mysteries. I was pleasantly surprised to find this book had a new main character named Matt Hawkins. Hawkins is an ex-SEAL who served in Afghanistan but was injured. He is now building Autonomous Underwater Vehicles (AUV) at Woods Hole in Massachusetts. I was hooked when the novel started in 1177 AD with the story of Philip, the physician of Pope Alexander III, who went on a journey to deliver a letter from the Pope to Prester John. Prester John was a fabled king of a Christian kingdom in the near east (Afghanistan region) during the early middle ages. At that point I knew this was one of those stories with a mystery from the past to be solved. With this novel Kemprecos has taken his stories to a new level. It’s like the type of story that Clive Cussler would write, which is fantastic! It’s a “page turner” with lots of action. I give this book 5 stars. I hope to see more “Matt Hawkins” novels in the future.